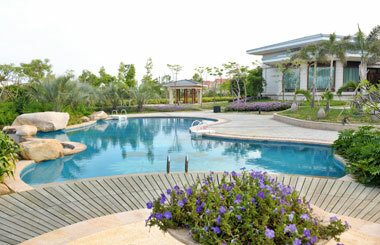 The very big holiday cottages and mansions frequently have a swimming pool for guests. When people rent one of these large group properties, the house and the swimming pool are reserved for the exclusive use of their group. This makes large self-catering houses most suitable for any type of group that is willing and able to cater for themselves. Big self-catering cottages with their own pool are popular with hen and stag groups who plan to have an enjoyable weekend going out to clubs and restaurants and spend some fun time together back at the house. A pool, sauna or Jacuzzi make a weekend break or holiday so much more enjoyable and an instant hit. Small clubs often require a big holiday accommodation to rent and self-catering keeps costs to a minimum. Clubs are used to organising rotas for cooking and housekeeping duties. The big houses are always very well-equipped with dishwashers and gadgets that make easy work of catering for a large number of people. Some will have two of every large domestic appliance. Walking groups, photography clubs, painting groups, bird watchers and others often need these big holiday homes to house a fair number of people. . The really large manors and mansions are often rented for wedding receptions and some permit the erection of a marquee in the grounds. Again, a pool is a great asset when entertaining a large number of guests.